Indian pastes are raw spices, milled and suspended in oil to give you the perfect balance of flavours. Americas pastes take the perfect balance of ingredients that last for up to 12 months unopened and 14 days opened. Easy to use in hot and cold applications. Water, onion, modified maize starch, rapeseed oil, malt vinegar (BARLEY), red chillies (4.5%), salt, garlic purée (2.5%), green jalapeno chilli powder (2%), concentrated lemon juice, parsley powder, paprika extract. 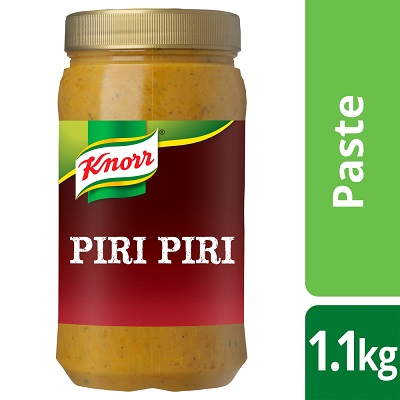 This paste is ideal for use as a marinade or flavour base. Use approximately 1 tablespoon (25g) of paste per portion in any application. contents immediately. Defrost in a refrigerator and use within 24 hours.